Thursday July 8th 1920 weather very pleasant. I slept late. Did some fancy work. Took a sleep in afternoon again. Wrote Hattie and Lydia. We spent the evening on the porch. Friday July 9th 1920 The day passed as yesterday did. Paul came home at 6 oclock. We spent the evening on the porch. Saturday July 10th 1920 We took an early start in Pauls new car. Mrs Helmich went for the ride. I left Davenport at 6.55. Reached Peoria soon after noon. Went up town for dinner and to rest awhile. Got out to Delavan a few minutes after six. It was raining very hard but the folks had arranged for a taxi to meet me. I found Charlie and Martie here. I was very tired. It is 19 months today since Will died. 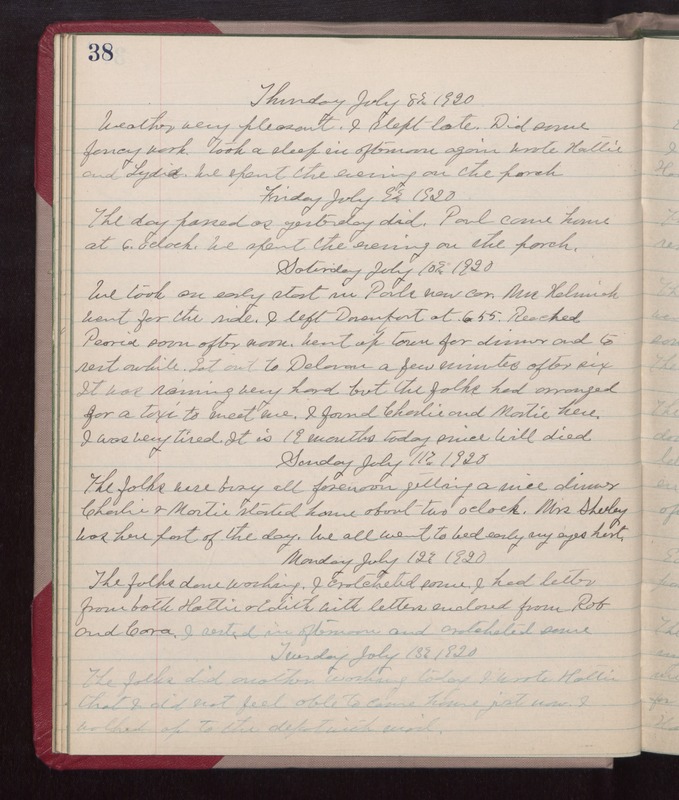 Sunday July 11th 1920 The folks were buys all forenoon getting a nice dinner. Charlie & Martie started home about two oclock. Mrs Sherley was here part of the day. We all went to bed early. My eyes hurt. Monday July 12th 1920 The folks done washing. I crotcheted some. I had letter from both Hattie & Edith with letters enclosed from Rob and Cora. I rested in afternoon and crotcheted some. Tuesday July 13th 1920 The folks did another washing today. I wrote Hattie that I did not feel able to come home just now. I walked up to the depot with mail.